Delivery van and limousine in one: Used as a fast van on weekdays, the Olympia Rekord Caravan scored well on Sundays as a comfortable four-seater on a family excursion. and is still used regularly as a delivery van to the delight of its customers. 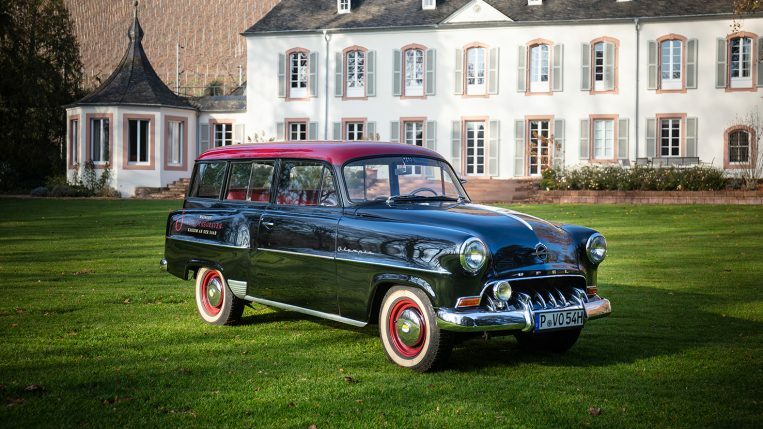 The Opel Olympia Rekord Caravan was one of the first station wagons on Europe’s roads 65 years ago. Today there are only very few examples left. One of them is on duty at a vineyard on the Saar. Its owner is TV presenter Günther Jauch. The call comes just before noon. A gastronomer from the neighborhood needs five wine boxes. The products from the winery “von Othegraven” are undoubtedly of the noblest nature, but the work on the yard in Kanzem in Rhineland-Palatinate is as down-to-earth as it should be for a proper winery: What can be done now is done now. So give him the boxes. And where is the next delivery van? 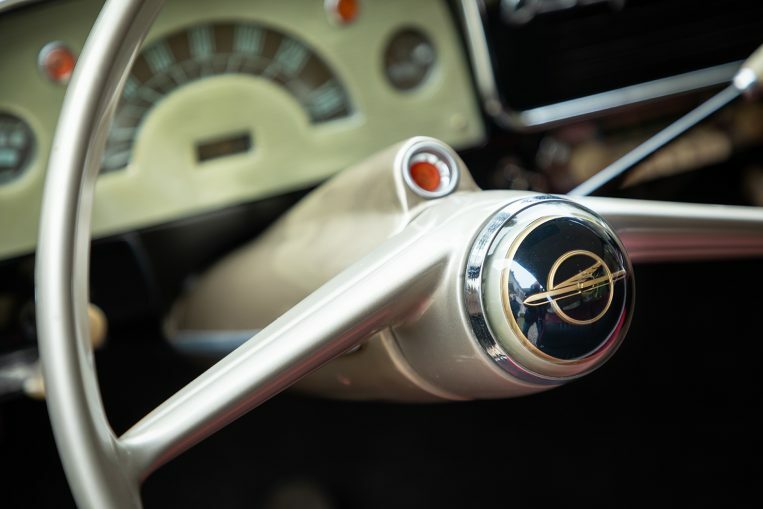 Estate manager Swen Klinger looks at the decoration of his fleet: an Opel Olympia Rekord, built in 1954. 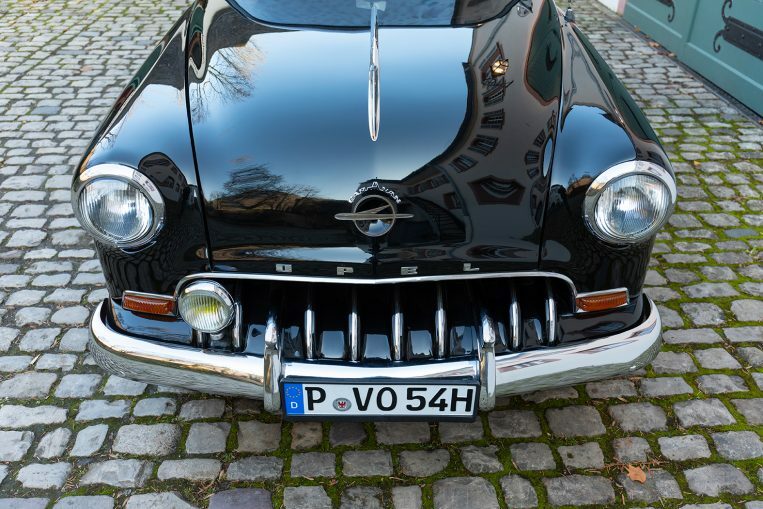 The Opel, for which the term “caravan” was coined – a word from the English “car and van”. And which later became so popular that people called every “station wagon” a “caravan”. Today the Olympia Rekord Caravan is an absolute rarity. Effortless loading and unloading: The rear door is hinged on the side; the maximum load capacity is 480 kilograms. All the more astonishing that this particularly beautiful specimen is still in use. “Of course, our oldie doesn’t have to go every day,” explains Swen Klinger, as he opens the tailgate, which is hinged at the side, and stows the boxes away. But as often as possible the deliveries are chauffeured by 39 hp and a three-gear shift. Kanzem is located about 15 kilometres south of Trier, surrounded by the Saar and an extended lock canal. The vineyard has been owned by the von Othegraven family since 1805, but vines were also cultivated on the steep slopes before that. Today the wine makers cultivate a total of 15 hectares of vineyards and fill around 100,000 bottles a year. All four vineyards – Kanzemer Altenberg, Ockfener Bockstein, Herrenberg and Wiltlinger Kupp – are among the most outstanding in the Mosel-Saar-Ruwer region. Only the Riesling grape is cultivated, which is developed by managing director and cellar master Andreas Barth in its entire range of flavours, from the purist-dry drop to the sweet Trockenbeerenauslese. 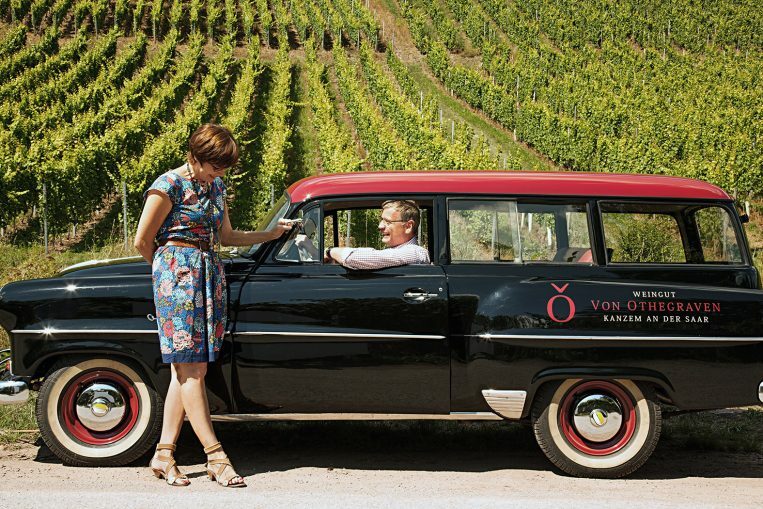 Family tradition: Günther Jauch and his wife Thea run the winery von Othegraven in the seventh generation. 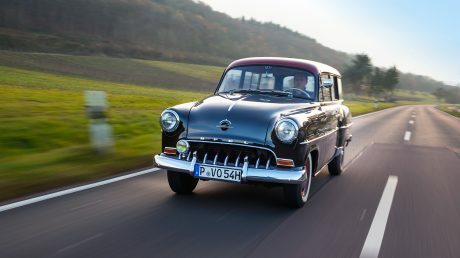 When the TV presenter took over the winery in 2010, he also bought this Opel Olympia Rekord Caravan, which ever since serves as a reliable delivery van. Mr. Jauch, your Olympia Rekord was the first station wagon that Opel produced in large scale serial production. It is thus the “original caravan”. Today the model is an absolute rarity. Were you aware of this when you bought it? No, I didn’t know that. I simply have a weakness for these “bread and butter cars”. These were mostly craftsmen’s cars that were scrapped at some point and that nobody wanted to keep. Today such a car fascinates me more than the – pardon – hundredth over-restored pagoda. 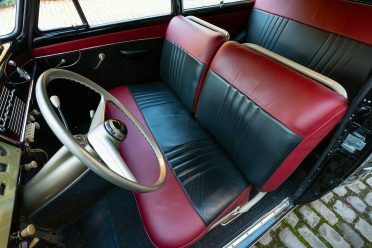 It was offered in the “Garage 11” in Hamburg, one of the first addresses for classic car fans. I discovered it on their online portal and observed it for a while. However, nobody seemed to want it, but I fell in love with him every time I clicked on him. After all, I went to Hamburg, negotiated well – and bought it. Did you transfer it to Kanzem by yourself? Sure I did. I have to admit that: In the mountains of Kassel he was exhausted. But I turned off the engine in time and had it towed away. Since then, the rule has applied at the winery: he can drive a maximum of 100 kilometres a day, that’s all he should be expected to do. But he manages the 100 kilometres without any complaints. 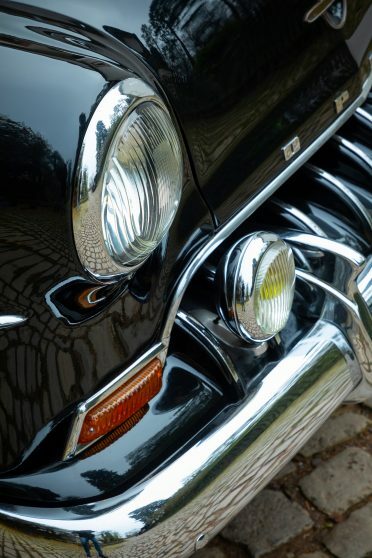 Do you enjoy driving this classic car? Very much! Three-speed shifting with 39 hp, starting by button in the footwell and in principle pre-war technology – that has something. A special plus point: its 6-volt electrical system works perfectly. The windscreen sticker “Opel – The Reliable” already guarantees that. 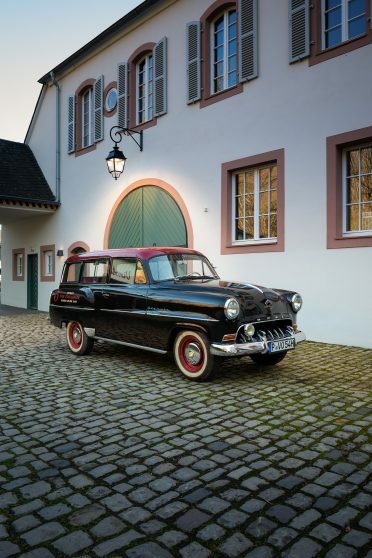 Kanzemer Altenberg: The von Othegraven winery with 15 hectares of vineyards includes the country house, an English landscaped garden – and this Opel Olympia Rekord. → Klinger’s least worry is that the 65-year-old Olympia Rekord could let him down. Engine, brakes, gearbox – everything works perfectly. The car is regularly serviced by the winery’s own staff – directly in the yard, with the help of a large “restoration folder” left to them by the previous owner. that grapes are still harvested by hand here, because the Kanzemer Altenberg, the heart of the winery, is one of the steepest and, at 250 metres, also one of the longest steep slopes in the world. The slope has a 65 percent inclination, which puts it in the same league as the Swiss Matterhorn. 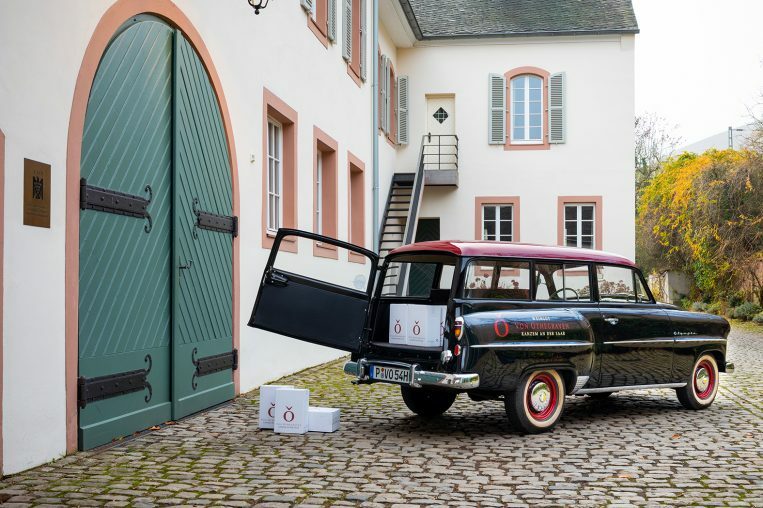 Von Othegraven is one of the top wineries and can look back on a long tradition – the wines used to be drunk at the courts of the European aristocracy. For nine years the estate, but also the entire wine region, has benefited from the aura of a prominent owner: Günther Jauch, Germany’s most popular TV presenter, journalist and producer. But the talk show host does not simply join the ranks of “celebrity winemakers” such as actor Brad Pitt, musician Sting or director Francis Ford Coppola. He acquired the estate out of family ties: “Günther Jauch thus continues a family tradition of more than 200 years. Together with his wife Thea, he now runs the estate in the seventh generation,” explains estate manager Klinger. Naming: The word creation from car and van is said to have derived from the question “This car is a van?“ This also explains the early spelling CarAvan. With the Olympia Rekord Caravan, a new type of vehicle emerged in 1954 – the lifestyle station wagon for the whole family. “The durable elastic-sprung upholstery is absolutely ‘scuff-proof’“, promises the advertising material in 1954. Family favourite: With its chrome shark mouth and its pontoon body the car was almost extravagant. Elsa, the grandmother of Günther Jauch, was a born von Othegraven. Her brother Maximilian was master on the farm as of 1925. Already as a child the young Günther came again and again to Kanzem to visit his great uncle; he played in the park and at the river and crawled around between the barrels. Even today, Jauch spends as much time at the winery as his busy schedule allows. Klinger: “When he’s there, he’s always there with all his heart, just like his wife Thea.” And he even leads visitors through a wine tasting when the time comes. “This is a very special experience – not because the owner of the house is prominent, but because he knows more about the history of the house than anyone else.” Under his own name, the favourite German presenter now also sells wine at discount stores. On the label: a silhouette of Jauch sitting on his “Wer wird Millionär” chair. He calls it the “democratization of luxury”. A motto that is also echoed in the Opel claim “The future is everyone’s”. Stylized Zeppelin: As a symbol of human innovation and technical progress, it adorns the steering wheel. The caravan differs from the Rekord by its purpose-built construction. And has already led to some amusing episodes. “Once we had just bought a new ride-on lawn mower when Günther Jauch came,” says Klinger. He wanted to try it out promptly. Shortly after that, a group of visitors came to the wine tasting and asked, as so often, if Günther Jauch could not say “hello” for a moment. “That’s just not possible, I replied, he still has to mow the lawn.” The group laughed heartily – “until the boss actually came around the corner, sitting on the mower”.